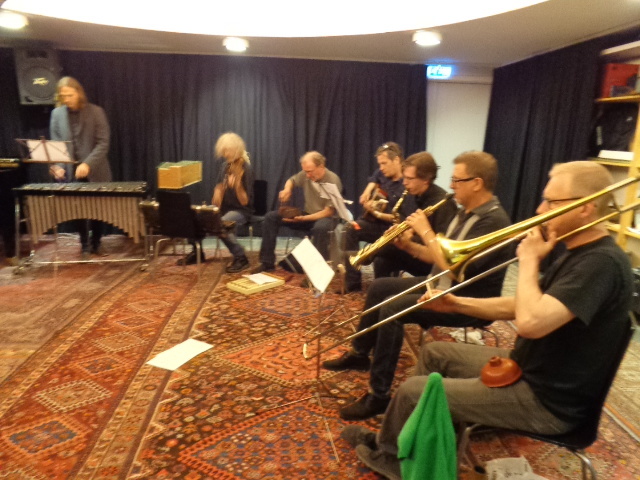 JG Thirlwell has been meeting and work-shopping with The Great Learning Orchestra in Stockholm, with a view to JG creating a major composition for them. When completed the piece would likely premiere in 2015. The Great Learning Orchestra is a network of a little more than one hundred musicians from different genres, cities and countries, meeting up to explore music with listening in the center. They are based in Stockholm, but collaborates with composers and musicians from all over the world. They have performed pieces by Terry Riley, Gavin Bryars, Lou Reed, Arnold Dreyblatt and many more, as well as performing a multitude of visual and instruction scores from a wide gamut of artists and composers. As their name suggests, they are structurally based on a model suggested by Cornelius Cardew‘s Scratch Orchestra.